Wheelie Good Coffee has already taken on a life of its own online. 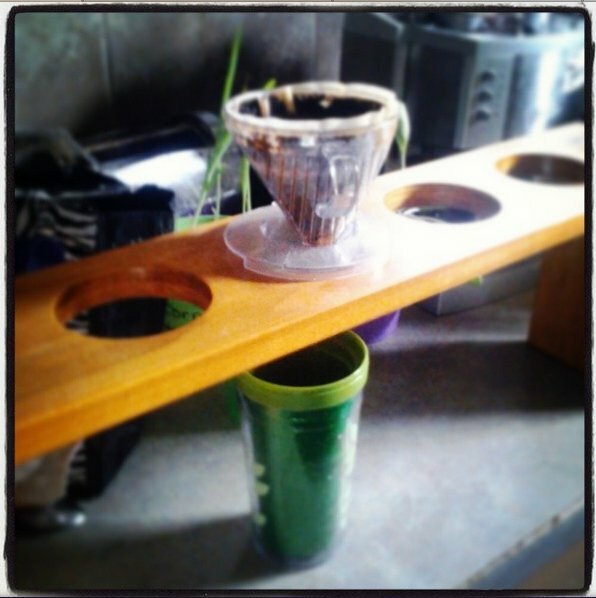 I’m at http://www.wheeliegoodcoffee.biz, and most significantly, @wheeliegdcoffee on Twitter. Twitter has been invaluable, both for inspiration and for the support to actually get this idea off the ground. I’ve received so many positive comments already that I feel more confident about this venture than ever before. Part of me attributes this to living in Regina, and particularly in Cathedral village, which is the first neighbourhood where I’ve encountered genuine community spirit. So to all my local Tweeps, THANK YOU, and I love you all! The business is relatively simple and small scale. 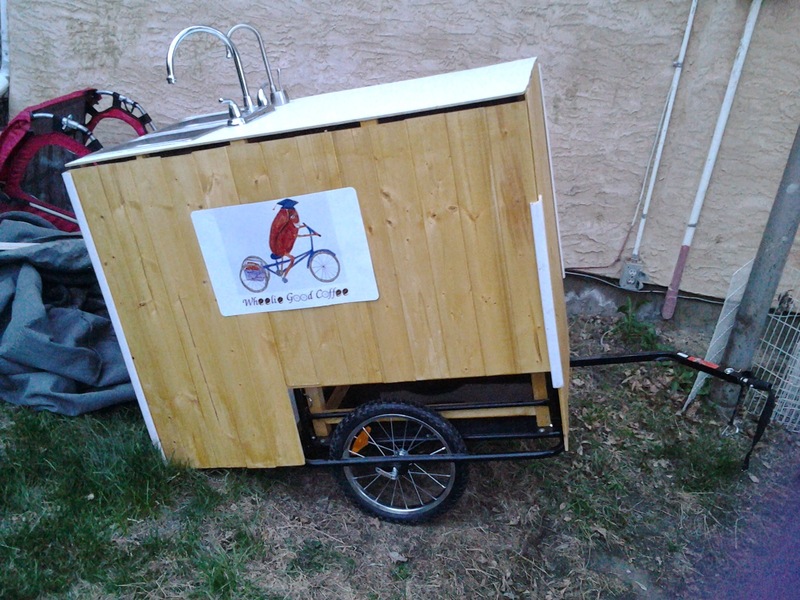 My wonderful, talented and handy husband built me a coffee cart – essentially a huge wooden box on wheels, housing an enormous kettle. This cart is pulled by my tricycle, Twyla, and I can pedal my way to events and trade outside downtown during the summer, at festivals, on markets, and so on. What’s that you say? How do I trade when it’s -40C outside? Well, that’s easy. I have a website where I sell my home-roasted coffee beans online, (teaching myself to roast requires a blog post in it’s own right! ), along with mugs, tee shirts, my books and various accessories. 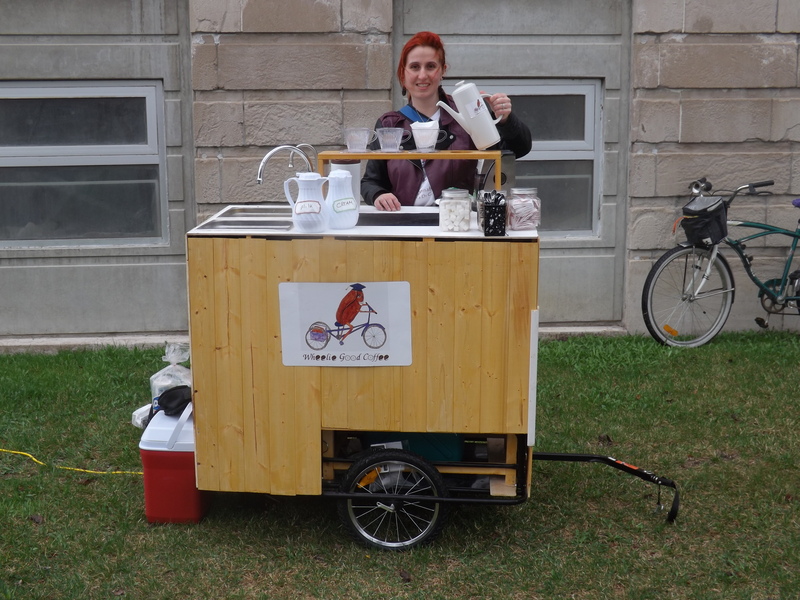 The weird looking, very conspicuous coffee cart attracts people, and those who say “I like your coffee, how do I make it at home?” get directed to the online shop. At least, that is the plan. Sadly, I didn’t get a photo of me in action. I didn’t have enough hands! I got utterly swamped, unable to make coffee fast enough! I was sponsoring an Arts Festival event, a mass singalong of Joni Mitchell’s Big Yellow Taxi outside Connaught school (read between the lines here!). If you turned up and sang, you got free coffee. In return, I got priceless exposure and publicity from it, a lot of tips (!) and a great opportunity to test out the coffee process with an appreciative and sympathetic audience. It worked – I got home to find online orders for coffee beans and despite exhaustion, I sat up til gone 11pm roasting coffee fresh for my new customers! This all happened on Monday, Victoria day and the first day of the Arts Festival. The weekend prior to that was just mentally busy for both of us. Eternal gratitude to Carl for building the thing, but getting it out of our basement proved nearly impossible. As Carl maintained, the cart did fit neatly through the door to the basement. However, what he’d neglected to account for, was getting it off the stairs, and round the side of the kitchen cupboards. ALMIGHTY amounts of swearing ensued, and all his neat edging got pinged off to spare half a centimetre. BUT, we got there. And it didn’t fall apart, nor explode, nor collapse under its own weight. We had to hire a generator because there was nowhere to plug in outside on the street, and that required a lot of inquiry. The Roca Jacks coffee beans were eventually hand delivered late Sunday morning, after I had got myself into a state of low-level panic over their absense. Cycling it was a whole new experience. In a terrible bit of bad luck, one pedal just sheared off my trike last week, leaving me with an annoyingly long walk home one night, and now, no engine for the cart. So I had to make do with Yoshi, the two wheeler. Suddenly, balance became an issue again. I didn’t have any time to practice, but fortunately the whole thing relied on momentum. Starting was agonising, and stopping required about ten feet and excellent brakes (not something Yoshi is renowned for!). But once I was going, it wasn’t too heavy at all, even with 50litres of water on board. However, I now have sore muscles in places I didn’t even know I had muscles. Toning your glutes really is a pain in the arse. BUT. I can pedal it. It does work. I make a GREAT fresh coffee. Bill’s Roca Jacks beans are just as good as they always were. Cathedral people are awesome, friendly and supportive, and the Cathedral Arts Festival got off to a great start despite the weather. I am achey, exhausted, happy and excited about Wheelie Good things to come! !